It can run, it can take corners, it can turn on the spot and even do slalom moves. But what is it? It's Asimo, the latest generation humanoid robot from Honda, unveiled today in Barcelona. Asimo has a more streamlined design than its predecessor, quicker movements, and new intelligence capabilities. 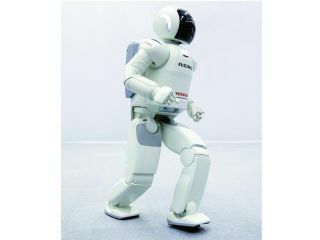 Developed at Honda's European Research Institute in Germany, Asimo can run at 6km/h and take corners at 5km/h. It interacts with people by recognising them, and greets passers-by. And as well as acting as your personal butler - it can receive and deliver trays - it can also push a trolley in a number of ways, Honda said. "The previous generation of Asimo amazed people with the fluidity of its movements," said William De Braekeleer, corporate PR manager at Honda Motor Europe. "The new Asimo takes this mobility and interaction with people to the next level and moves Honda one step closer to its ultimate goal of developing a robot that can be a helper to people in need." The new Asimo robot will be on display at the Barcelona Biomedical Research Park as part of the city's 'Year of Science' until Saturday.